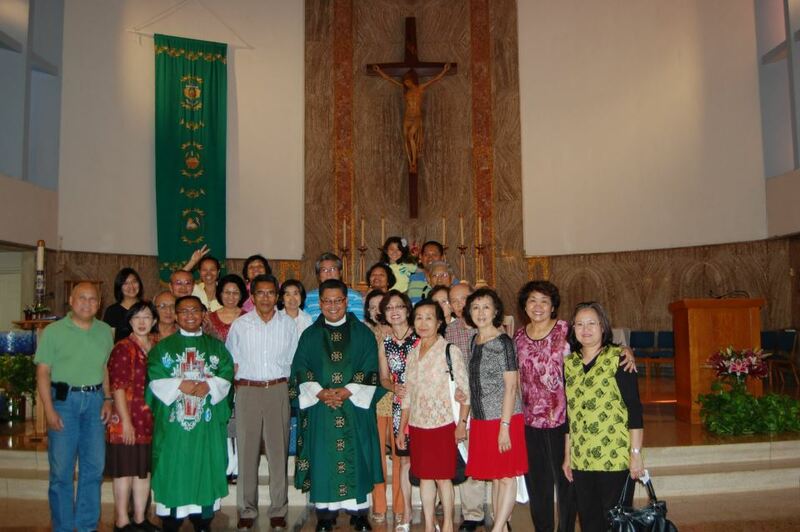 The beginnings of the Indonesian Community of the Archdiocese of Los Angeles (IC-ADLA) began with a group called “Indonesian Catholic Families of America” (KKIA) who were brought together not only by their common culture but also by their love of the Eucharist especially celebrated in Indonesian. John & Mien Hartanto, Dr.Robert & Marietta Tango, Justine and Joseph Goei, Tom & Olly Tan, Edwina and Ronnie Oei, Albert & Cecilia Massie, Sr. Xaviera Pl., The Poppy & Brian, were some of the original founders. The group’s first mass in Indonesian was celebrated on January 1, 1984 by Fr. Wim Van Gaspel who was studying in Spokane, Washington at that time. This was followed by another Eucharistic Celebration on January 27, 1984 at Incarnation Church by Fr. John Dohne, OSC who was vacationing in the area with his family. On February 11, 1984 at another celebration Romo Dohne invited other Indonesians from Orange County. There was a huge turnout of Indonesian Catholics which prompted the formation of a committee headed by John Hartanto on February 19, 1984. On April 22, 1984 the first Easter Celebration was celebrated by the community for the first time in Fullerton. The mission of KKIA is to foster Catholic faith among its members and to strengthen the cultural bonds with one another as well as to support one another in America. In 1991 KKIA became "non-profit organization" and was then called KKIA, INC. As the community continued to grow, there was an urgent need to become part of the Archdiocese of Los Angeles. On September 17, 2001 KKIA Inc. became the Indonesian Community of the Archdiocese of Los Angeles (IC-ADLA). Thanks to the assistance of Sr. Irma Isip, Director of Asian Pacific Ministry Archdiocese of Los Angeles to our first chaplain Father Linus Tiala. Saint Stephen became the official home of the community. Fr. Larry Estrada who was the pastor at that time was instrumental in our smooth transition to the archdiocese. The Rev. Budi Wardhana is the first Indonesian to become a priest in California, the third in the United States. Fr. Budi came to the United States when he was 23 to earn his MBA in marketing. His plan was to return to Indonesia and start a business. When he was in graduate school, he met a former businessman who was studying theology, hoping to become a priest one day. He found himself drawn to the priesthood but resisted, deciding instead to pursue a career selling Indonesian food online. One year later, he said, “I felt empty in my heart. I felt God was asking me to serve others.” So at the age of 27, Budi entered St. John’s Seminary.